A therapy dog’s main purpose is to bring a smile to human beings and brighten their day. These dogs provide love and comfort to people with a variety of needs. Therapy dogs are “volunteers” at a variety of institutions, which they visit with their owners/handlers. These owners/handlers, like their dogs, must be trained and committed to being directly involved in the therapy process. Most therapy dogs provide short-term service on an intermittent basis. Where Do Therapy Dogs Serve? Some therapy dogs go into full-time service as companion animals in a home or other environment. Most, however, continue to live with their families and are invited to visit institutions and facilities periodically as a community service. Therapy dogs only go where they are invited. As the benefits of canine therapy are becoming more widely evident, the dogs are now invited into many different places. These can include hospitals and rehabilitation facilities, long-term care and assisted living facilities, hospice and mental health facilities, geriatric centers, schools and libraries. Dogs and their handlers can visit anywhere they are welcome and anywhere they can meet a need! Therapy dogs provide companionship, love and comfort to people on a volunteer basis. With their handlers, they visit various facilities to meet people who may feel cut off from human companionship, who may profit from the tactile sensation of petting an animal, or who may need some good memories stimulated by seeing a friendly canine face and a wagging tail. Scientific studies have proven that petting and interacting with a dog lowers stress hormones and blood pressure and helps relieve depression. Besides the physical benefits, dogs make people smile and laugh, forgetting some of their own troubles for awhile. Therapy dogs contribute much to improving the quality of life for the elderly, the ill, and the emotionally frail. In addition, therapy dogs are used in educational settings such as schools and libraries. A friendly, patient dog can give children hands-on experience in learning about animals. Some therapy dogs participate in programs for children with reading problems. Children report that reading to a dog is a much less intimidating experience than reading in front of their peers. These children don’t have to fear making a mistake in front of a canine audience, because dogs never judge! Therapy dogs have also made successful visits to special needs classes in schools. Withdrawn children sometimes interact more readily with a dog than with another human. Non-verbal children have even been known to speak to a dog brought into their classroom for a visit. How Are Therapy Dogs Selected and Trained? The most important quality for a therapy dog is a good temperament. Therapy dogs should love to meet strangers and show their pleasure by wagging their tails and their bodies. Their excitement at meeting a new friend should be balanced with the ability to remain focused, calm and non-aggressive. The dogs’ training begins with obedience classes. At this point they learn to respond to commands from their handlers. They should also be exposed to the sights and sounds of the medical equipment that they will encounter in the various facilities they will visit. Additional training can bring the dogs to the Canine Good Citizen level, which is required for dogs working in most facilities. This certification means a dog has been able to comply with a set of ten elements that define what it means to be a well-behaved animal. The dogs can also go on to become Certified Therapy Dogs. Dogs who have earned this certification have passed an examination that evaluates their high levels of obedience and control. The handler is being trained at the same time, of course. Why Are Australian Labradoodles Especially Suited to Becoming Therapy Dogs? The Australian Labradoodle is an intelligent breed that usually responds well to the rigorous training required to develop a therapy dog. They have a good temperament and love being around people. In addition, some Labradoodles seem to have the special gift of empathy with human beings. They will typically make eye contact with people, which some breeds do not. The physical characteristics for which they were originally bred – their non-shedding, hypo-allergenic coats, lack of odor, and sturdiness – also make them particularly good candidates for working in institutional settings. 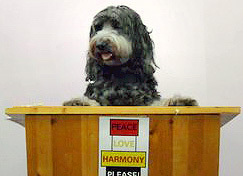 How Are Barksdale Labradoodles Involved in Therapy Work? Barksdale Labradoodles has three practicing Certified Therapy Canines – Southern Cross Smooch, aka “Smooch*;” Barksdale’s Blue Boomerang, aka “Boomer;” and Barksdale’s Fleur-de-Lis, aka “Lily.” These three dogs live with the Gordys as family pets and are handled on their therapy visits by Al and Jacqueline Gordy. A fourth Barksdale dog, Ranger, was also trained as a service dog and placed in a home but returns to the Gordys occasionally to do therapy work. All the dogs are certified through The Foundation for Pet Provided Therapy, aka Love on a Leash. *Smooch was the first non-human ever to win the Heart of Hospice Award from the Louisiana-Mississippi Hospice and Palliative Care Organization. How Is a Therapy Dog Different From a Service Dog? A therapy dog’s job is different from a service dog’s job, but both jobs require the intelligence and temperament common to the Australian Labradoodle. Click here to read more about service dogs. Southern Cross Smooch & Springcreek’s Ranger. These two Barksdale Labradoodles have worked in tandem to make others ‘smile’ for quite some time. It’s all about a hug! Some Special Place. Miss Mississippi with Jacqueline, Smooch and Lily. About Our Adult Dogs We remain a firm believer in the one home concept for our Doods. Those that live with us find this to be their “forever home” and we work hard to keep it that way. Others that are part of our program live in “Guardian” homes with their “forever folks”. None of these Adult Doodles are for sale.